His fellow passengers aboard the 83-foot Cetacea shared Toomajian’s viewpoint Wednesday morning as they set sail from Lynn’s Blossom Street extension dock for the 8 a.m. trip to Boston. “Good morning, folks — happy hump day,” announced Captain Bill Muise as he sounded four blasts on the Cetacea’s horn. It takes 37 minutes on average for the ferry to travel from Lynn to Boston, and Toomajian, fellow passenger Erik Sundell of Lynn, and other commuters spend the time drinking coffee, listening to music, talking or soaking in the sun. “The crew is friendly and courteous, and you’re not cramped into a train car,” Toomajian said. The Nahant resident shared a top-deck bench on Wednesday with Stefan Thibodeaux, who started riding the ferry last summer during its inaugural season. Thibodeaux and a half dozen other passengers, including Sundell, brought their bicycles on board the ferry on Wednesday in order to complete their commutes to jobs in Boston or Cambridge. Thibodeaux biked from Marblehead to the ferry dock and planned to ride from the ferry’s Boston dock next to the New England Aquarium to Cambridge. “Sitting out in the sun and looking around is the best part of the ride,” he said. The ferry has operated under a pilot program with the state since spring 2014. The city Economic Development and Industrial Corporation hired Boston Harbor Cruises to provide a boat and crew, and EDIC received $759,000 in state money last year and $769,000 this year to pay for the ferry. EDIC Executive Director James Cowdell said the city wants to secure long-term state financing to sustain the ferry operation for 2016 and beyond. “The best marketing we have is our customers. We will present ridership numbers to the state and argue our case for a permanent ferry,” he said. The ferry runs through Sept. 25 five days a week with morning trips from Lynn at 6:30 a.m. and 8 a.m. and 6:30 p.m. and sailings out of Boston at 7:15 a.m., 5:45 p.m. and 7:15 p.m. One-way trips cost $7 with youth and senior discounts. Muise said the two morning trips from Lynn on Wednesday totaled 88 passengers — an average number. They included ferry veterans, such as Revere resident Sheila Ercolini, who rides almost every day to Boston, and newcomers like Audrey Young of Swampscott. Young is starting a part-time job at St. Elizabeth’s Hospital and is thinking about taking the ferry and riding her bike to the Boston hospital. 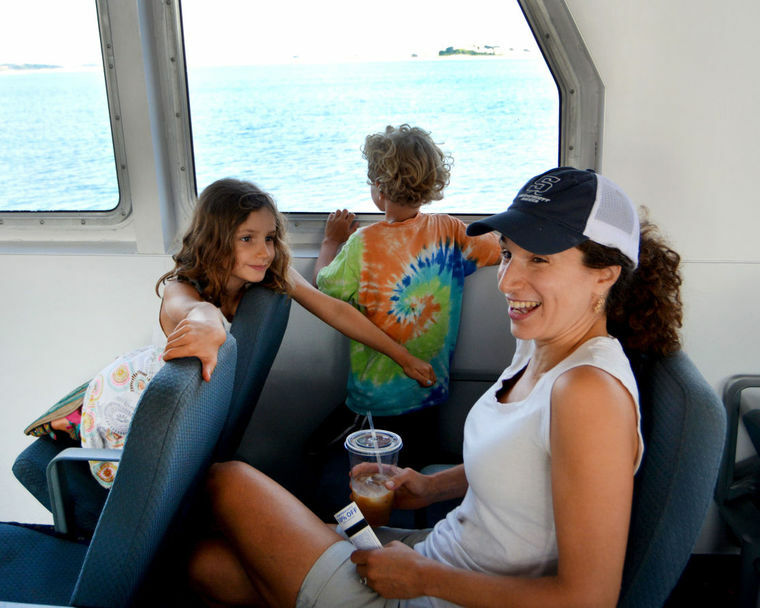 She boarded the Cetacea Wednesday with her 7-year-old daughter, Eliana, and son, Dermott, 5, who announced he intended to devote his ferry ride to searching for whales. Muise would like to see the ferry operate from Lynn to Boston year-round. The former accountant abandoned a desk job for the seafaring life 18 years ago. He has been a captain for 15 years. “I love the Lynn run. The people are nice and, on a calm day, it’s a pretty smooth ride,” he said.